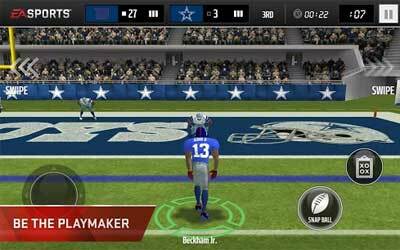 Previous version Madden NFL Mobile 4.1.1 apk for Android will help you to downgrade or install older app easily. This is one of the best Sports apps. You can check the team feature and choose patriot team as one of the best teams for the game. You can also choose which play types you want to play, whether it is offense and defense. It is better to look for some tips to play the game for better experience. We have some tips to play the game based on the features on the game. The first tip that you should try is looking at your position whether you are on offense position or on defense one. If you are on offense, it will be better to see any open receivers, so you can pass the receivers better. In otherwise, if you are on defense position, it will be better to avoid any possibility for your open receivers, so you can break the strategy of the offense team. There are still many tips that you can read for better experience with this game. Pick your team and get the best score with best experience on Madden NFL Mobile for Android. Only issue was with auction but it’s been fixed and everything else is just amazing.